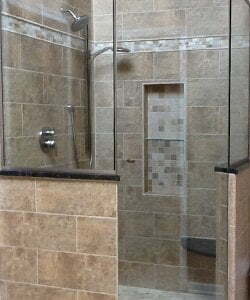 GlassWorks is known as the one-stop-shop for customers who are in search of the best shower enclosures and glass shower stalls in all of Chicago. GlassWorks is known for having the skill and familiarity in this field and to get all your glass shower enclosures and glass shower door enclosure done with ease. That’s one of the many reasons why GlassWorks has been known widespread throughout the Greater Chicago Metropolitan Area for over 37 years for having the installation specialists of architectural glass that people need. GlassWorks is pleased to take great pride in our first-rate glass shower enclosures and regardless of the kind of glass shower enclosure you may require, we have what you need. Similarly, we have been delivering exclusive award-winning services to Glencoe occupants with our widespread selection of glass shower enclosures and glass shower stalls. With that being said, we serve on average 4,000 customers each year and counting! Glencoe, Illinois is a village that has just about 9,000 residents and it is located roughly 7 miles from our main office in Glenview, which is very close! Glencoe is located in Cook County on the suburban Chicago’s North Shore. Whenever the residents are in the market for glass shower enclosures or glass shower stalls, they call GlassWorks because they know we have the greatest around. The residents of Glencoe welcome our elegant shower enclosures that will also create a dash of flair and zeal to their bathrooms. Therefore, Glencoe residents are very mindful that GlassWorks can change any glass shower stall or shower enclosure to give them what they have always dreamed. Our shower glass is frequently stated as “safety glass” that will keep you safe within your reinforced shower glass structure. Congruently, your new glass shower enclosure or glass shower stall will make your bathroom a place where you can relax and unwind. Ease of maintenance and cleaning. Customers are endlessly gratified with us because we can provide them with prices that they are comfortable with along with quality, here at GlassWorks. Ranging from our frameless glass shower doors to neo-angle glass shower doors, glass steam shower enclosures, framed glass shower doors and custom glass shower doors, GlassWorks has everything you may need! Whatever type of glass shower stalls and shower enclosures you have been observing our GlassWorks’ installation technicians are very talented and can do anything! Give GlassWorks a call today at the following number: (847) 729-5580 to receive a free estimate. Or for an appointment, fill-out our online form for a 10% reduction. See you soon!